It’s been more than three weeks since Tessa’s surgery in which she had an allograft, or cadaver MPFL, placed in her left knee, and so far her recovery has gone very well. While I suspected that her condition was largely genetic since my oldest daughter, Callie, required the same surgery a few years ago, now I am not so sure. You see, Callie’s knee was tilted towards the outside and her lateral ligament on the outside of her knee was tight. As a result, in addition to the allograft, Callie also had a lateral release performed as well as a bit more work to straighten her patella. Tessa, on the other hand, required just the allograft and no additional work was performed on her knee to stabilize it. The same doctor performed the surgery on both of my daughters. He said Callie’s ligaments were very tight while Tessa’s were extremely loose, so much so that her knee could almost be hyper-extended. As a result of having less work done on her knee, Tessa had less internal irritation initially and seemed to recover even quicker than her sister immediately after the operation. The nerve block she came home with for two additional days of numbness also helped. Tessa was only on her prescription pain medications through Monday or 4 to 5 days, while Callie took the medication for one full week. Beyond that, their recovery has been very similar. Tessa did not return to school until Thursday, Sept. 13, which was one full week after her operation. I believe she could have returned a little sooner, but she was concerned about being able to keep her leg elevated during classes. And keeping her leg up was key to keeping her swelling down. After seeing her orthopedic surgeon for her first follow-up appointment on Monday, Sept. 17, Tessa abandoned her crutches. That was just 11 days after her surgery. The next day her physical therapist began to open her brace to bend up to 60 degrees at the knee. She then had it opened up to 90 degrees, even as she walked, one week later starting on Tuesday, Sept. 25. Tessa experienced some serious muscle memory loss. It was over a week before she could reliably and consistently flex her left quad muscle, and even a little longer before she could lift her left leg without assistance. But she has been diligent about her physical therapy exercises, and we continue to see improvement. Tessa leaves the brace off once in a while when she is lounging around the house, but generally she continues to wear it. She experiences some discomfort after a long day on her feet or if she moves wrong, and she still applies ice to her knee at night. But overall, she is doing well. Her wounds are about closed, and she has begun applying Mederma to them to keep her scaring at a minimum. Even though her initial recovery was faster than her sister’s, I don’t expect Tessa to be released for full activity any sooner. The allograft was the most invasive procedure for both girls, requiring the most rehabilitation. I still suspect it will be five months or more before Tessa can resume any joint-intensive activity such as hard running, jumping, twisting, etc. And it will probably be a year or so before she’s back to full strength and regains confidence her left knee. And that’s all right. At least the most intense part of the fix is over. Now we just need to have patience and remain committed to her recovery, even when she starts to feel almost normal. I still can’t believe it happened. It was the last basketball game of the season at the end of March, and she fell to the floor grabbing her knee. Those of you who have followed my blog are probably thinking my oldest daughter Sports Girl – Callie – hurt her knee again. But it wasn’t Callie this time; it was my middle daughter, Tessa. It took us a while to accept the fact that Tessa has just experienced patellar subluxation in her left knee just as Callie had at about the same age. We even encouraged Tessa to go back into the game to keep playing. She tried, but she promptly came back out explaining that her knee started to give out again. She was in pain, and she was scared. We continued with our denial. Since it was the end of the basketball season, we thought perhaps Tessa could recuperate and do some exercises and light weight training on her own to get past it. But her knee slid out two more times during physical education classes during April and May. Then Tessa attended a week long basketball camp in early June. While the knee didn’t actually sublux during the camp, it did swell considerably. And so we dug out her sister’s old pre-surgery knee brace for her to use and scheduled an appointment with the orthopedic surgeon later that month. Handsome Hubby was ready to schedule surgery right away. But even with her sister’s history, the surgeon approached Tessa’s issue conservatively. Unfortunately, it was a familiar routine with a familiar ending. Tessa completed six weeks of physical therapy, and she performed the exercises faithfully. But when we went back to the doctor late in July, he wasn’t satisfied with the results. When he started to wiggle her kneecap with her leg extended straight, Tessa experienced extreme apprehension. To be honest, she about came up off the table. So today I am sitting at the hospital waiting for Tessa to come out of surgery – the same surgery Callie had done almost three years ago. Tessa is having a cadaver ligament inserted in place of her MPFL to stabilize her knee. She will also most likely have a lateral release performed and any other maintenance necessary to allow her knee to track better. Callie hasn’t been completely without issues. She has had some discomfort and mild swelling around the ligament when she resumes a new strenuous activity, such as when soccer practices started twice a day in early August. There’s also the scars which will always be present on her young skin around her knee. Callie has some general tightness in her knee, as well, and cannot always easily bend her knee far enough to touch the back of her foot to the inside of her thigh. But I can’t do that either! But we do know from Callie’s experience that the surgery works; it leaves the patient in better shape than before. And so we are going through it again with our second daughter at an even slightly younger age. Callie had surgery shortly after she turned 14; Tessa just turned 13 in May. Both girls had the surgery as eighth graders in school. The goal is to save precious cartilage that is damaged with each subluxation. I always thought that Callie’s initial injury was primarily due to some sort of unusual blow to the knee she received during physical education class. But after Tessa has had the same injury, it’s hard to deny that the issue might be due in part to genetics. Rylie is only five, and we know that this surgery cannot be performed until the patient has finished growing. But we have joked that perhaps if we get Rylie’s knee fixed now, we might be given a buy two, get one free offer. But we are only kidding. We are hopeful Rylie can somehow avoid the same fate. Besides, we know the health care industry doesn’t offer any such discounts anyway! Sports Girl has finished her first post-operation soccer season without incident! She made it to every practice and played in all 10 junior varsity games for her high school. 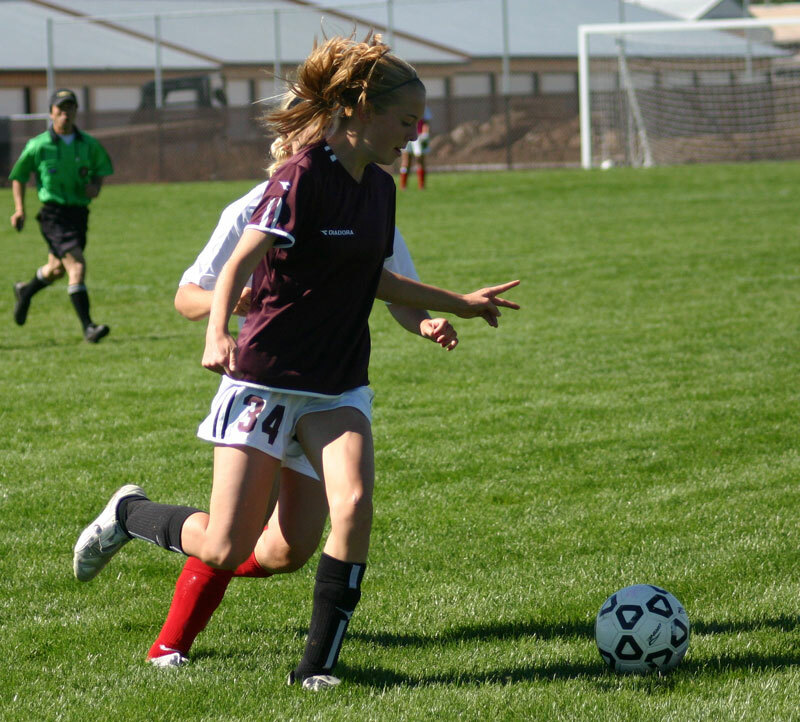 Sports Girl (maroon) goes for the ball in a high school girls junior varsity soccer game. If you look closely, you can see part of Sports Girl's scar on her left knee here. And while she may not be quite as strong competitively as she was before her knee issues began, she was mostly without pain and without worry that her knee would pop out of place throughout the intense, 7-week season. And she didn’t wear a knee brace at all! So as we approach the one-year anniversary of her surgery coming in mid-December, I am almost ready to declare it a complete success. My only hesitation is seeing how things go on the basketball court. You see, it was the first week of middle school basketball practice that delivered the final blow to Sports Girl’s knee issues at the end of October last year. Basketball involves more jumping and quick turning than soccer, and the hard indoor court is actually harder on Sports Girl’s knee than the soft grass soccer field even if it is sometimes uneven. Basketball shoes do provide more support and shock absorption than soccer cleats, thankfully, and we will soon be shopping for Sports Girl’s new high tops. 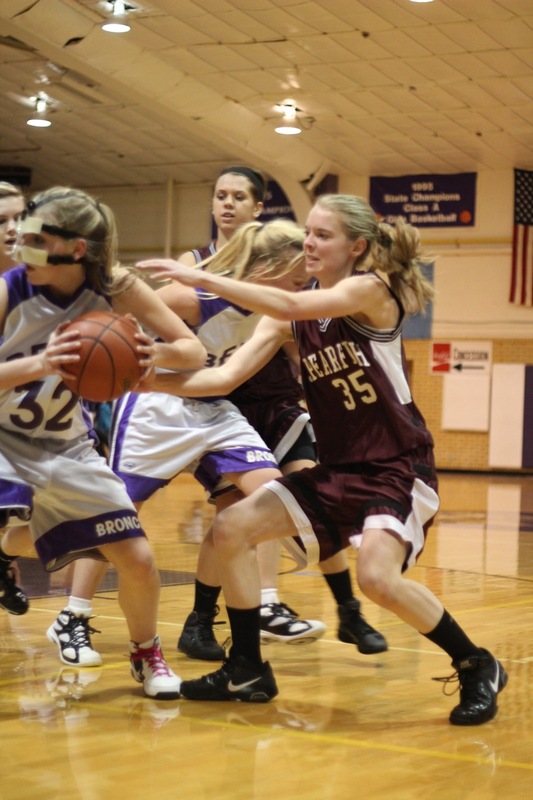 High school girl’s basketball won’t actually start until around Thanksgiving. Between now and then Sports Girl plans to keep running and lifting weights a few times each week at the local recreation center to stay strong and ready to play. Sports Girl has worked hard the past 10 months to recover with physical therapy, performance training and other practices and workouts. She can’t quit now or the results of all her hard work could all but disappear in the six or seven weeks she has off in between soccer and basketball. So while Sports Girl is looking forward to a break from regular team practices these next several weeks, I know she has no intention of giving up on her physical progress. Horse Lover shows Sadie on halter in an English class. We also borrowed her attire. 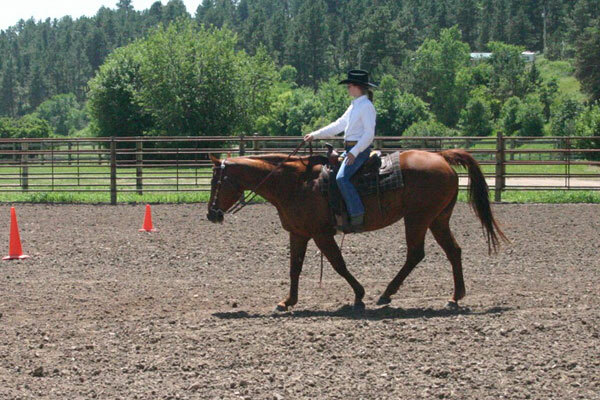 Horse Lover competes on Sadie in a Western riding class. We borrowed saddles for the show. I made arrangements in June to board our experienced, 19-year-old show horse, Sadie, at a barn where Horse Lover could also take riding lessons. After just four or five weeks of lessons, Sadie was tuned up, and Horse Lover had made significant gains in her horsemanship skills. I’ve written before about Horse Lover’s lack of opportunity to ride. So this effort was generous on my part, and it meant the world to my daughter. Horse Lover wanted to leave Sadie at the barn to take lessons much longer, but unfortunately we just couldn’t work that extra expense into our regular family budget. You see, one thing has become painfully obvious to me as I’ve tried to make Horse Lover’s dream of becoming a seasoned horsewoman a reality – horses are extremely expensive to keep, and are even more expensive to show. A friend of ours once had a bumper sticker on her SUV that read simply, “HOR$E$.” I now have a complete and total appreciation for the profound and true statement that one-word bumper sticker made. All winter Horse Lover begged us to take riding lessons. She wanted nothing more than to ride her horse. But with frigid temperatures outside and things like school occupying the bulk of her time inside, we just couldn’t make it happen. There was also the challenge that we still didn’t have a horse trailer to transport the animal, and riding lessons were expensive enough without also having to pay to board the horse. But somehow as the weather warmed and school let out for summer, we managed to make lessons work for our pre-teen daughter, and she was in heaven. I took her to the barn a few times each week and waited and waited and waited while she learned to brush, halter, bridle, saddle, ride and put away the horse. As a result of this time (and money) spent, Horse Lover and Sadie earned several blue ribbons at our 4-H county horse show at the end of June, and she is now ready and eager for more riding experiences. So instead of satisfying one of her desires, we simply wetted her appetite, it seems. While she is no longer incessantly begging us for riding lessons, she is begging us for LOTS of other things including a new western saddle, an English saddle, a horse trailer, an outdoor riding arena, a barn and even a new horse. She’s worried Sadie might be a little too old and too arthritic to lope or gallop. Just last week we found a used western saddle in good condition in Horse Lover’s size, and we paid $600 for it. She had outgrown the youth saddle she was using and so the need for a saddle was imminent if she was going to continue riding the horse. The other items she wants aren’t needed as urgently, at least not according to Handsome Hubby or myself, and that’s good. Because every one of them would cost considerably more than $600. As a parent of three, I’m used to buying my kids one thing and then having to buy more to go with it. Think Nintendo DS, iPod or even small toys like the Littlest Pet Shops. Each item requires additional game cartridges, headphones and cases or houses and additional animals. I did a quick count just the other day and Horse Lover has more than 25 cases for Nintendo DS games on her bookshelf. So including the game system, we’ve probably spent almost $1,000 on this system over the past several years. That’s crazy, but it wouldn’t even come close to how much we’ve spent on this horse obsession in just the last few months! Besides the big-ticket items I’ve already mentioned, we regularly buy feed and fly spray for the horses. We also pay the farrier to trim hooves and the vet for vaccinations. We have free access to a pen and pasture in which to board the horses right by our house, and we get ample hay from Handsome Hubby’s father and brother on the ranch. I couldn’t imagine having to pay for these items, as well. I can honestly say that if we did, we wouldn’t have horses. But since we do have the set up and we already have the horses, I’m sure we’ll continue to invest in Horse Lover’s obsession as much as we can. I hope she can be happy with what we are able to do and doesn’t always just want for more. It’s been a long time since I have posted, and I know many of you are following Sports Girl’s progress as she recovers from her MPFL replacement surgery. To you I apologize. I hope you assumed that no news was good news, because things continue to go well. Sports Girl steadily cut her times in both the 800k and 1600k in track through mid-May. She went back to her orthopedic surgeon on June 2, and – as we had anticipated – was fully released to resume all of her former physical activities and sports. It was a great day, and barring any future complications or other issues, it was our last visit to this doctor. While we would recommend this physician to anyone without hesitation, for reasons that should be obvious, we are grateful that Sports Girl doesn’t have any future appointments scheduled with him. Since then, Sports Girl has been strength training and conditioning three times a week in a summer training program offered by the local high school athletic trainer/physical therapist. She has also participated in open gyms twice a week in preparation for basketball; she has even played in a few summer league basketball games. She had some discomfort in her left knee during the first basketball she played, but subsequent games seemed to go better. I am sure my knees would hurt if I tried to play a basketball game in my out-of-shape state, so hopefully her pain was due more to her lack of recent activity than to the surgery itself. It’s been a little over 6 months since Sports Girl had her surgery. While we had hoped her recovery would progress much faster, all her caregivers have said she has done remarkably well. Just yesterday I took Sports Girl to our local family practitioner for her annual sports physical examination. This is the same doctor who referred us to the orthopedic surgeon at almost exactly this time last year. Since Sports Girl has not had cause to see a doctor this past year other than for her knee surgery, our family doctor hadn’t known how his referral had turned out. He was genuinely interested, and we were thankful that he knew of a doctor who took a proactive approach to frequent patellar subluxation issues. I know of a couple of middle-aged women who have just lived with this problem and the pain and discomfort that goes with it for much of their lives. Horse Lover's passion revealed itself early. 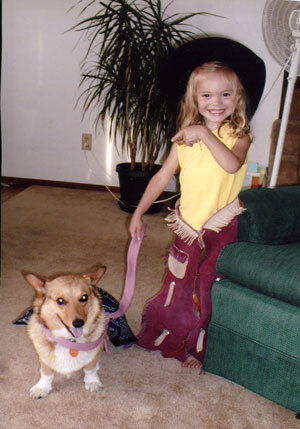 Here she is at 3 years of age using our Welsh Corgi as her trusty steed. Note the saddle blanket and lead line. I'm sure she would have had a halter around the dog's nose if she would have allowed it. Sometimes I think Horse Lover was born into the wrong family. While we do live in the country, and we actually have two horses at our disposal, Horse Lover doesn’t get to ride them near as often as she would like. Honestly, she hardly ever gets to ride at all. That’s because Handsome Hubby is gone a lot for work, and my horsemanship skills are seriously lacking. Horse Lover actually knows a lot more about horses than I do, but unfortunately horses are just too large and potentially dangerous for a pre-teen to ride without some experienced help and supervision. Even if Handsome Hubby was around more, I don’t know if Horse Lover would get to ride any more often. Handsome Hubby grew up riding horseback while working cattle, not for leisure. He might not admit it, but he really doesn’t get the intricacies of showing horses in shows or even understand the importance of certain skills such as proper “posting” techniques. But Handsome Hubby does respect the knowledge Horse Lover has accumulated through reading and watching. 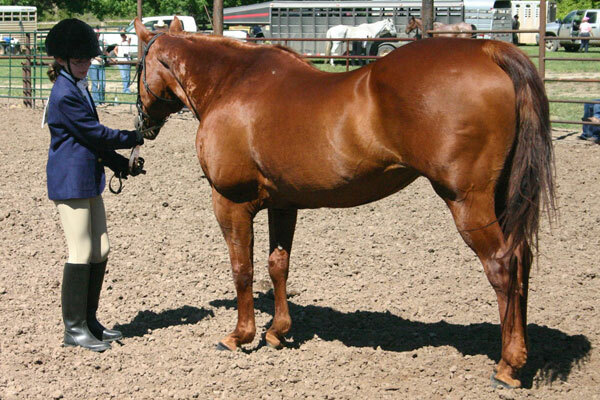 He might even admit that Horse Lover may already know more about horsemanship and equitation than he knows. Meanwhile, I must confess that I really don’t want to add horsemanship to my list of lifetime skills. I feel bad about that sometimes, but I have absolutely no interest in riding horses. That probably makes me a bad parent, but at least I’m honest! I do feel some pressure to take up horseback riding for my middle daughter’s sake, but I don’t know when I would do it. As the old saying goes, “There are only so many hours in the day,” and I believe I am already trying to cram too many things into those hours. Thankfully, Horse Lover is somewhat cautious in her horseback riding approach. So we don’t have to worry about her going off and trying to ride horseback without help. Yet her apprehension does have its drawbacks as it keeps her from improving her skills very quickly. Horse Lover would like to compete in our county 4-H horse show this summer, but she is scared to ride Sadie, our horse with show experience. The horse is well trained, but she likes to test her riders, and she is a bit rusty. Both Horse Lover and Sadie need some training help, but that presents another problem – we don’t have a horse trailer to transport the horse nor do we have the extra hundreds of dollars at our disposal to pay for these services. Would It Be Easier If We Didn’t Even Have a Horse? Sometimes I wonder if it would be easier on Horse Lover if we didn’t have a horse at all. Wouldn’t it be easier for her to handle NOT riding if she didn’t even have a horse to ride?